This entry was posted on Sunday, December 20th, 2009 at 9:02 am	and is filed under Candy and Fudge, Holiday Foods. You can follow any responses to this entry through the RSS 2.0 feed. You can leave a response, or trackback from your own site. Anybody have the old “Gingies” cookie recipe, I think it was in an old Betty Crocker cookbook? Meanwhile, let me know if you’re interested in my great ginger-snap recipe, let me know, and I’ll post it on the blog. This recipe sounds and looks scrumptious. Thanks for posting it! 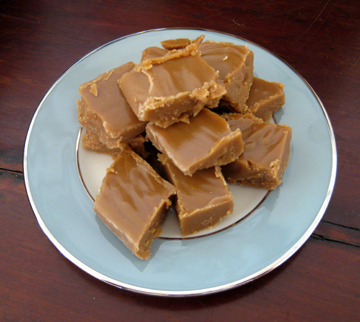 I love ALL your recipes this month, and I have a particular fondness for fudge. 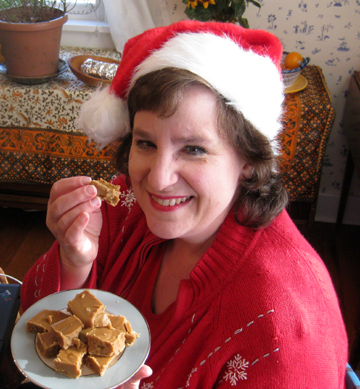 My Texas mother made candy every holiday – especially fudge and divinity. Our household was also big on bourbon balls, sugar cookies and sand tarts. I still have a favorite tin where she kept the ones just for the family. But more than the recipes I especially love seeing the great pictures of YOU! Thanks for indulging my hammy nature, Teri! If you have any of your mom’s recipes, I’d love to feature at least one next Christmas–and maybe the sand tarts or sugar cookies for one of my 12 Days of Cookies during the year. Have a happy……..